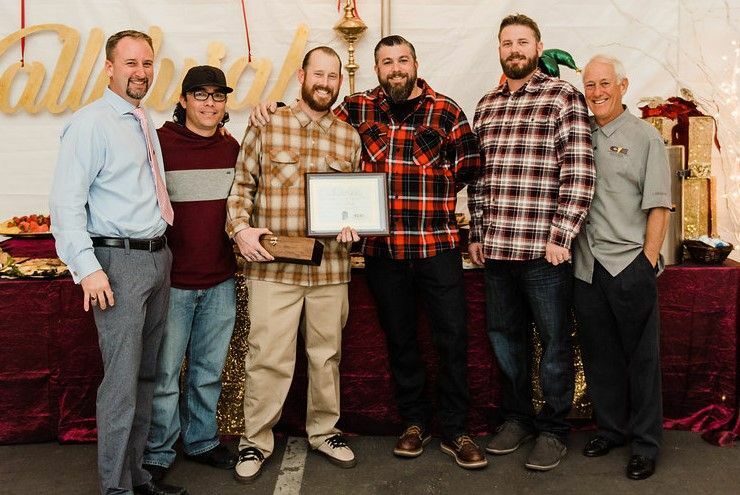 We presented the 5th Annual David Avila Memorial Award at our December 8th Christmas party. In January, our winner will be with Champion 3 years, he has always displayed the kind qualities and work ethic we associate with the David Avila name. This year’s winner was hired to work at Browning HS originally and we knew there was potential with him when we did not receive any complaints from our Foreman, Mike Howarth. He attended our Foreman Training Classes and ran a successful Solar Project with almost no office support. From there, he was given his own elementary school project in Long Beach and started coming into his own. The General Contractor’s team for the project on multiple occasions, stated what a great job our Foreman was doing and how great his attitude was. Anthony Centanni, rocked it at Riley ES and we look forward to the positive impacts you are going to have a Las Encinas alongside Garret, Jacob and the rest of the team. Congratulations Anthony Centanni!! 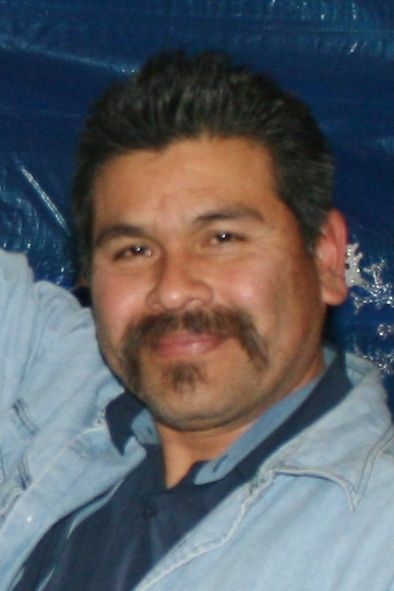 In late 2015, there was an unexpected passing of David Avila, who worked for Champion Electric Inc. between 2000 and 2015 (ten years consecutively). He showed up every day, rain or shine, sick or well and always put in an honest day’s work. He never complained and was always willing to do any job he was asked to do. When David was given a task, you didn’t see him until it was complete. He cared about the people he worked with and lifted the spirits of everyone around. David Avila was a true Champion! In his honor, this award was created in 2015. The purpose of this award is to recognize and honor a Champion Electric Inc. employee who has demonstrated a similar work ethic as David Avila. This employee goes above and beyond what is required of him/her on a regular basis, demonstrates dependability and loyalty to Champion, is a team player, and a great asset to the company. Any active employee, employed for the entire year nominated is eligible for the award. The Executive Team and prior years recipients will select the next employee who best addresses the stated criteria. 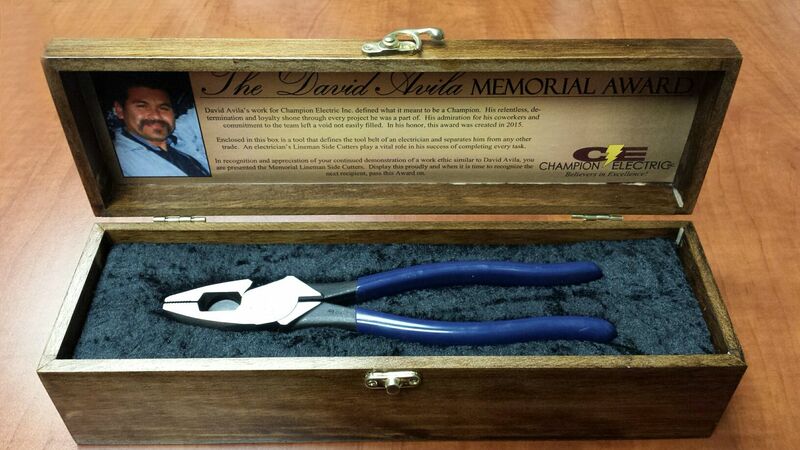 The winner will be presented the David Avila Memorial Klein Side Cutter award which they will keep until they present it to the following year’s winner. The winner’s name will be engraved on the David Avila Memorial plaque and a photo of the employee will be displayed in his/her honor. The winner will also be presented a certificate of achievement and a gift card. 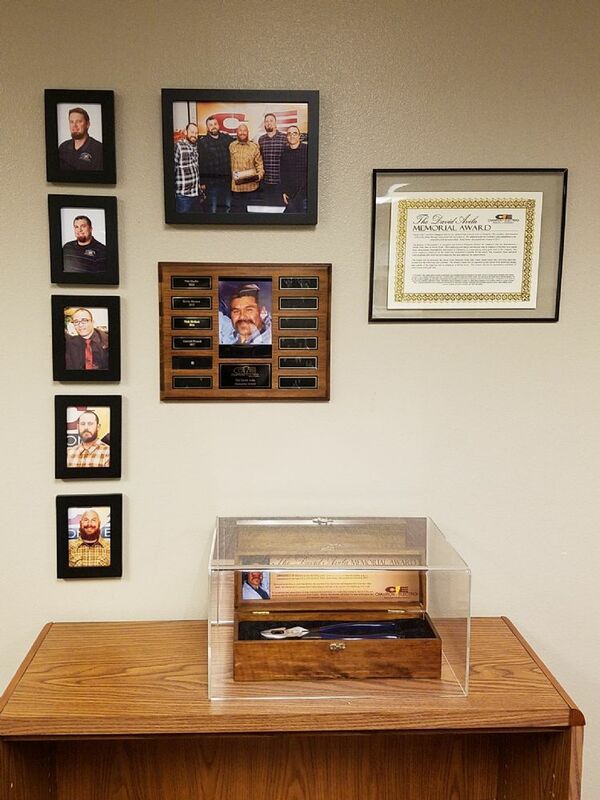 To honor the memory of David Avila (1958-2015), the family requested donations of Home Depot gift cards to be given to Electrical Apprentices to help with the cost of tools they will need with their career. David’s family ask only that the recipients know that these gift cards are given in the memory of someone that enjoyed his work, worked hard, was always ready to lend a hand and enjoyed sharing his knowledge with others. Every year, the Greater Riverside Chamber distinguishes a local small business with the Small Business Eagle Award for demonstrating leadership and achievement in operating a small business. Eligible businesses must have less than 50 employees and operate in the Riverside area. Achievements of the nominees should reflect both past and current activities. The company must be registered as a California business and be a Chamber member in good standing. Recipients will be selected by the Chamber, and are evaluated in five categories, which are: staying power as a substantial business for at least three years; increase in number of employees; increase in sales and/or volume; innovations of the products or services offered; response to adversity; and evidence of contributions by nominee to aid community oriented projects and contributions. Glenn Rowden talks about this award in the below video. March 27, 2013 – Cindy Roth, President and Chief Executive Officer of the Greater Riverside Chamber presents at the 2012 Small Business Eagle Award at the Riverside Municipal Auditorium. Applause as Glenn Rowden approaches the podium. “Wow, well it’s quite an honor to be up here and have this award. This is a wonderful, wonderful organization, the Chamber. Just to be associated with people like Cynthia and Brian and all the folks that are part of this is phenomenal let alone to get an award. I got to thank my employees, greatest people. They have survived with us through thick and thin. They have been wonderful. My family is here, my wife Cyndi who’s been an awesome partner with this thing from the very beginning, my father, who has a lot of sweat equity in Champion Electric Inc. My son out there is doing a wonderful job for us.